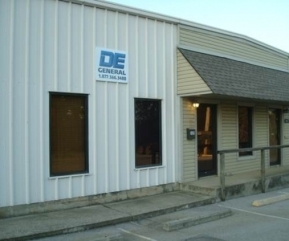 Company History | DE General is the Southeast region’s premier disaster restoration company for both commercial and residential losses. DE General is a family company, started in 1973 by Gerald Evans as a small carpet cleaning company named Castex, Inc. Tim Evans began his career with Castex in 1986 when he became a full partner. From this modest beginning grew the seed that would ultimately grow to become the multi-industry company that DE General now anchors. When Tim Evans purchased Castex in 1988, he expanded it to include disaster restoration services, incorporating his extensive knowledge of the construction industry to offer full restoration and reconstruction services in one package. In the early 1990's, Tim relocated the growing enterprise to its home base in Birmingham, Alabama. Although Evans sold Castex, Inc. in the late 1990's, his original business model was reborn as DE General a few short years later. The DE General brand has enabled Evans to incorporate a more diversified business model over more recent years. Today, DE General thrives as one of the most respected and trusted disaster restoration companies in the Southeast with its home office now centrally located in Birmingham, Alabama. DE General is proud to have served Alabama for over forty years as we continue to cultivate and expand our disaster restoration network throughout the Southeast region.